Zebra Cake??? Well, of course it's not a cake that using ingredients from any part of Zebra. 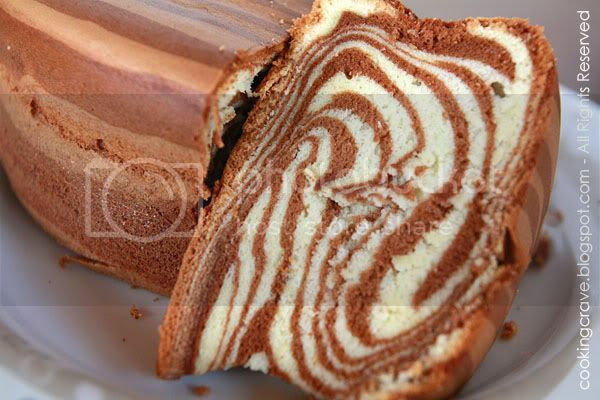 It's just the pattern that resembled Zebra and end up we called it a Zebra Cake. This cake are soft and spongy. Not too oily and not too dry, it's just nice. It taste particularly like the normal sponge cake we can get out there, nothing special. The only thing that make it so unique is it's Zebra pattern on it, very beautiful pattern !! This cake is not too hard to bake as well. The only thing that we need to look at it is the oven temperature. The cake tend to brown very fast at the top part and I have to adjust - on and off the top heat several time to ensure my cake are not burnt on the top. Actually I have bake this cake 3 times already with different recipes provided by others. But, I still love the one shared by Jo's Deli & Bakery one the most. The texture of the cake are very light and soft. Like I said, it taste just nice not too moist or dry and it's not too sweet as well. If you are free and never tried this cake before, go ahead and give it a TRY!! finished all the batter and it's ready to be baked in the preheated oven now!! Dissolve cocoa powder and chocolate emulco in water. Preheat oven at 170c. 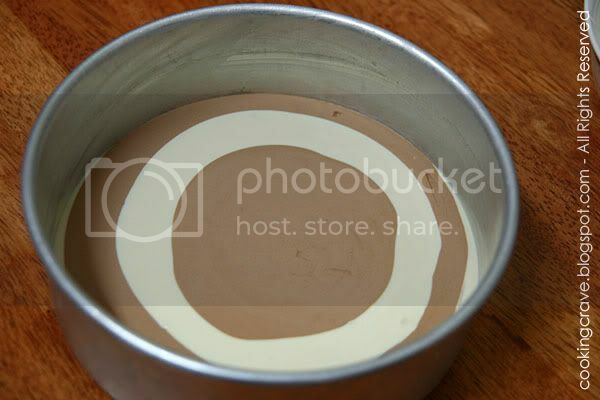 Prepare and grease a 8 inch round cake pan. Beat eggs, flour mixture, castor sugar and emulsifier (ovalett) on high speed for 10 minutes* or until batter turns light and creamy, i.e. thick ribbon state. **To test, lift beater. Batter drops from beater should disappear when you count from 1 to 10. Pour in melted butter, condensed milk and vanilla essence (if any). Mix at slow speed. 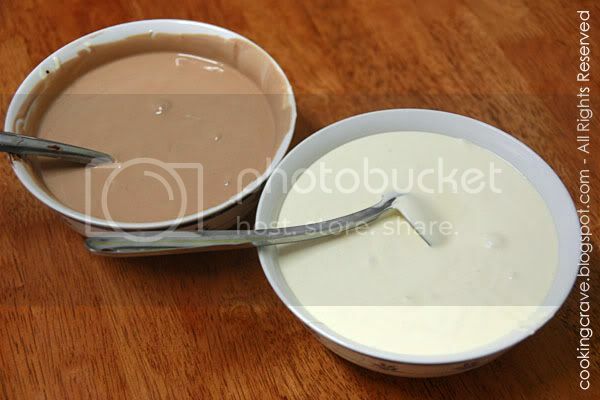 Divide batter into 2 equal portions. Fold in chocolate solution into one of the batter. Using small soup ladle (original recipe from Jo's used spoon, I tried it with spoon before and it failed to produce a nice pattern lines on the cake) Scoop 3 of uncoloured batter into center of the greased cake pan. Then, scoop 3 of chocolate batter onto the center of the plain batter you just scooped into the pan. Repeat until you have finished about half of the batter. Reduce to 2 scoops each now and continue layering. Reduce the amount of batter gradually until you only pour 1 scoop of each batter finally. The circles become smaller and smaller as your pour (Pic. 4). Sprinkle almond nibs or flakes to cake. Bake at 170c for 35-40 minutes or until the skewer insert comes out clean. Let cake in pan for 10 minutes before turning it on to a wire rack to cool complete before we cut and serve it. 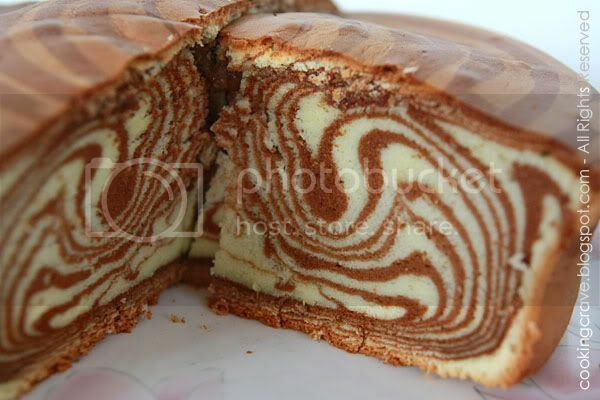 Yiii... Zebra Cake look like so tempting! Hey send two piece for me okay? Look really like a Zebra,hehehe..Thanks for sharing. Looks so zebra! I used only 2 yolks and more egg whites for my zebra cake. Would you like to take a look? 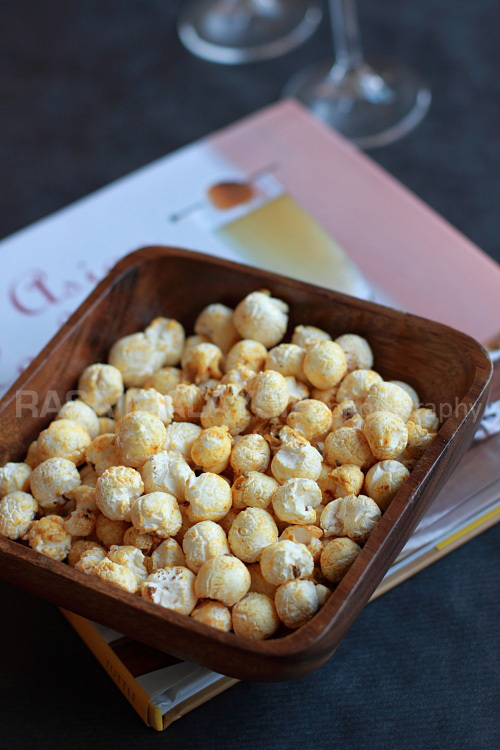 Wow...from wat seeing oredi tempted...no need to ask the taste anymore!..i will try next baking, tks for sharing! Looks really like zebra woh!emmmm i hungry now. Hi Amy..such a wonderful design cake...exactly like the zebra skin. Well done! 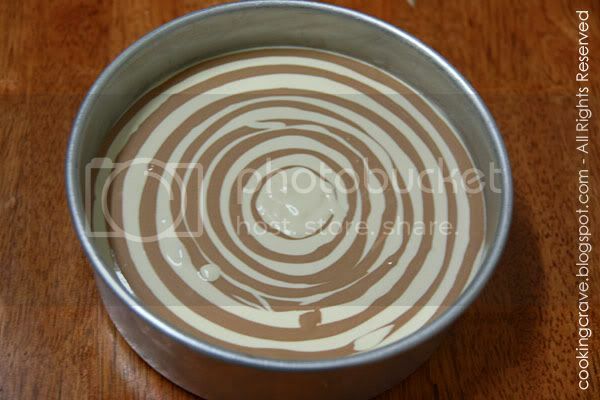 I love the look of the zebra cake.. hehe.. I've never tried making layers in my cake. I shall give it a go someday.. This looks really tempting..
hi, may i know which brand of self raising flour you using? "Beat eggs, flour mixture, castor sugar and emulsifier" all these ingredients mix in together or 1 by 1, eggs need to beat 1st? hi, may i know what brand of seld raising flour u using? (Beat eggs, flour mixture, castor sugar and emulsifier) *eggs need to beat 1st? * all these ingredients mix together or one by one? Hi I am at Melbourne , if I cannot find cake flour and ovalette, how?